Besides South Africa, central Africa is the most isolated part of Africa. For many years, the people who lived here saw almost nobody from outside their own area. So it took longer for people in Central Africa to find out about new inventions. But even so, some historians think that people were smelting iron in the Great Lakes area (modern Uganda and Rwanda) by around 500 BC, even earlier than iron technology reached West Africa. By about 800 AD, the people of central Africa who lived along the Limpopo River, in modern Zimbabwe, started to keep sheep and cattle. Neither sheep nor cattle are native to Zimbabwe, so these people probably got the sheep and cattle from Bantu people living to their north. Maybe around the same time, people in Zimbabwe, the Karanga or the Shona, also began speaking a Bantu language. What did Central African people buy and sell? Around the same time, Karanga people in Zimbabwe seem to have started selling animal furs and ivory. Maybe they were shipping furs and ivory down the Limpopo river to the East African settlements on the coast of Mozambique. They also seem to have been mining and shipping gold from Zimbabwe down the Limpopo river. In return, they got lots of glass beads, probably from India, and also cotton cloth, steel knives, and probably Indian medicine. Possibly the Medieval Warming period improved the climate in a way that made Zimbabwe richer than before. Just after 1000 AD, these people in Zimbabwe began to build the first big stone palaces ever seen in central Africa. 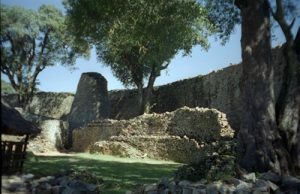 The most famous of these palaces, which were called zimbabwes, is called Great Zimbabwe, and it was built around 1250 AD. Musicians living in the Zambezi valley invented the mbira, a new musical instrument. By 1450, however, there was less trade with East Africa than there had been before, and Great Zimbabwe began to be abandoned. Climate change may again have played a part, as the Little Ice Age made south Africa cooler than before. And possibly people were dying of the Black Death – the bubonic plague. Nyatsimba Mutota started a new kingdom, Mutapa, a little further north, covering what is now northern Zimbabwe. He kept selling ivory and added copper and salt. What is the Little Ice Age? The next ruler, Matope Nyanhehwe Nebedza, then expanded toward the coast, to control the seaports, so that by 1480 AD he ruled most of Mozambique too. The Forest People, by Colin M. Turnbull (1960s, republished 1987) (this is not a kids’ book, but it is a great account of life in the African rain forest). Cite this page: Carr, K.E. Who built Great Zimbabwe? Central African history. Quatr.us Study Guides, October 2, 2017. Web. April 21, 2019.